I had a few days off this week, and took advantage of the opportunity to fish a nearby stretch of water that I heard was not iced over. I found that it was in fact flowing well, and enjoyed fishing for a couple of hours. Hiking down a snowy trail to a trout stream is always fun, especially so close to Christmas. I had plenty of layers and a Filson hat to fight the cold, and had a great time tossing streamers for the big trout that I hoped were lurking under the surface. It was slow going for a while, and I took a few moments to sit on a rock, breathe in the fresh mountain air, and enjoy the fact that I was not in the office. After taking a break on the bank of the stream, I resumed casting, and felt a tug on the line. After a decent fight, I landed a nice rainbow. It was likely the last trout that I will catch in 2013, and I was very lucky that it was such a beautiful fish. The time on the river allowed me to reflect on the great friends that I have fished with this year, and met through the fly fishing community. I've been very blessed, and looking forward to many more trips in the future. Merry Christmas! 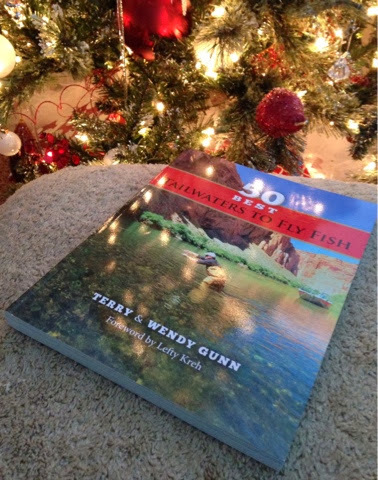 I've been able to spend some time with my copy of The 50 Best Tailwaters to Fly Fish by Terry and Wendy Gunn. I love to read, especially during the recent subzero, snowy days that we have experienced, and have thoroughly enjoyed this book. The book is 253 pages of outstanding color photographs, infomation, and anecdotes about Tailwater Fisheries across the country. It is broken down by region, and there is a ton of local information and wisedom from local experts about how best to fish the water highlighted. 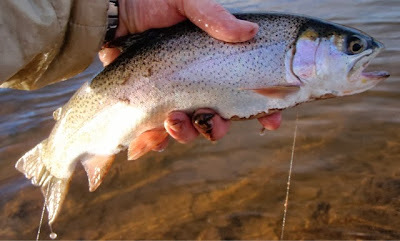 I've fished several of the Tailwaters in the book, and found the information to be accurate, helpful, and detailed. So detailed in fact, that information is given about the cell coverage for each river. Although we like to say that part of the reason to go fishing is to get away from our phones, it is very helpful to know if you can make that quick call home in the midst of exploring the area. Other helpful facts like the nearest medical help, lodging, and the closest fly shops are included. 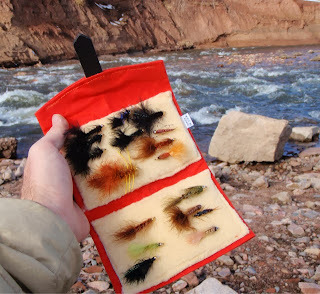 Three of the most productive days of dry fly fishing that I have ever had were on the Fryingpan River. I'll never forget fishing large Green Drake dries on a soft, Scott G flyrod. I'm not sure that I caught a trout under 16 inches. I read the section on the Fryingpan with interest, and learned a lot of information that will be very useful on my next trip there (since big Green Drakes are not always the fly of choice!) There was information on where to fish,how to fish, and what to fish. A complete breakdown of the common insects, fly patterns and seasons, and common hatches will make a first trip to a new river that much more successful for someone that has never fished there. The book is broken down into the following regions, which each contain numerous rivers: The West, The Rockies, The South, and The East. In the East, I found an article on the Muskegon River. I have many fond memories of fishing this river when I lived in Michigan, and I read it with interest. With the information I learned from reading this, I realized that I need to go back....there is a ton of water and techniques that I missed! This book is not only fun to read, but is a great reference that I will keep nearby. The 50 Best Tailwaters to Fly Fish earns Dry Fly status. I just picked up the new Fly Fisherman 2014 Gear Guide that recently hit the newsstands. BDF friend Cameron Mortenson has a feature article on the fiberglass fly rod revolution which he has been a huge part of. 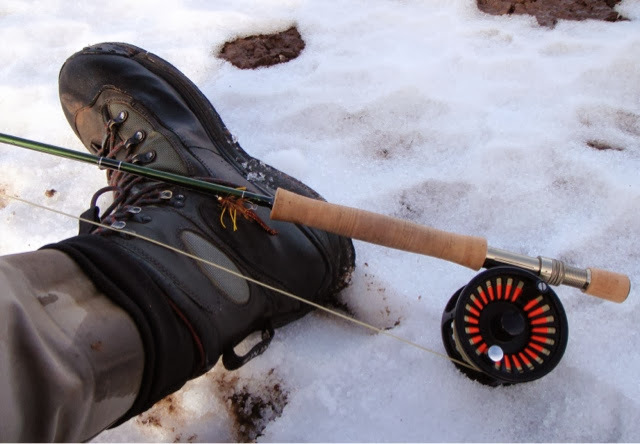 I've got a few "noodley" fiberglass rods that I like to fish on small streams on occasion, and I am looking forward to reading the article, especially on an evening like tonight, when it will be close to -15 degrees and snowing.